Limousines of Cheshire is a wedding car company based in Byley, near Middlewich, Cheshire. We are dedicated to providing a first class wedding car service on your wedding day, from the first contact right through to the wedding day itself. With our stunning range of Beauford wedding cars, luxury Rolls Royce, Daimler Landaulette, Baby Bentley, Mercedes and Stretched Limousines, we are confident that we will have something to suit all tastes and budgets. We can tailor our wedding car package to suit your requirements and special requests. Hire a wedding car from Limousines of Cheshire and make it a journey to remember. Our experienced chauffeurs, in their smart uniforms, will give assistance in and out of the wedding car as required ensuring that you arrive relaxed, in comfort and on time. Hire one of our chauffeur driven Beauford 1930's style wedding cars for your wedding day and find out why they are the most popular bridal car! Finished in gleaming wedding white with soft cream leather interiors and chrome detailing, you will be sure to arrive feeling and looking like a princess. Our Beaufords will carry 2 passengers. If you have lots of V.I.P's to transport we can do multiple journeys or why not consider one of our matching Stretched Lincoln Limousines or Mercedes Limousines. Modern engineering and opulence at it's best. Our two matching Chrysler "Baby Bentley's" are available singly or as a matching pair. Both cars have beautiful and very sumptuous leather upholstery in excellent condition and matching lambswool carpets & over-rugs together with every modern convenience inc climate control, sat nav, adaptive cruise control, auto braking etc etc. Superb modern engineering for the discerning bride. With the trend for more modern wedding cars we now offer the cars as a matching pair (His 'n' Hers perhaps) for £550 for the full wedding. Within 15 miles and 4 hours hire. Contact us for availability. Modern "Baby Bentley" in gleaming silk white with contrasting luxurious grey nappa leather interior with burr walnut dash, door cappings and sheepskin rugs throughout. Absolute luxury and versatility in a very modern & stylish saloon. Perfect for church, registry office or civil weddings, or as a second car for the bridesmaids to match any bridal colour scheme. A truly magnificent car with satellite navigation, climate control and all modern safety features. Beautiful & stylish in the classic 4 door saloon design with spacious boot. Price for a full church wedding - £275. The Lexus Sedan Limousine is the pinnacle of luxury motoring, nothing else rivals it for comfort and space. With gleaming metallic Quasar Blue paintwork (almost black) and sporting a cream leather interior, this 3/4 passenger executive wedding car will sweep you to your destination in exemplary style & comfort. Floating along in almost total silence, thanks to the double glazed windows and air suspension, this car never fails to impress. Rear climate control, rear heated & cooled reclining seats,rear DVD player and even a fridge !! Long wheel base model so plenty of room in the back - it will easily accommodate even the grandestwedding dress. Great for night transfers to hotels or the airport, and we offer the car for corporate hire as well. If you want to feel like an "A" list celebrity on your wedding day, or just have lots of V.I.P's to transport, then one of our stunning 8 seat Lincoln Towncar Limousines are the wedding car for you. Custom built in the USA, these amazing cars have every extra you can think of. Luxury black leather J-seating, air conditioning, premium sound system, TV, DVD, fully stocked bars with all glassware, mirrored ceiling, flashy lights & superb air suspension to list just a few. With large rear doors and masses of space, you are sure to arrive relaxed and feeling like a Hollywood star! We are pleased to offer a modern "E" class Mercedes 7 seat saloon in white for the grooms party, bridesmaids and/or family members or as a bridal car. Matching elegantly with all our other cars the limousine offers comfort and flexibility to ensure everyone gets to the church on time. Seats seven people comfortably with all-forward facing seats and has a full compliment of seatbelts so we can accommodate child car seats if required. This car is manufactured as a long-wheel-base limousine by Binz (Limousine specialist department of Mercedes-Benz) and is therefore of a much higher standard than the usual after market "stretched" Cars with 3 rows of quality leather reclining seats, electric windows and air conditioning. The Daimler State Limousine was the late Queen mother's favourite car and has been used on visits by Heads of State for decades and of course on Royal weddings - the last one being Prince Harry & Meghan, Duke & Duchess of Sussex. The limousine can seat up to seven passengers when the 'occasional' seats are used. There is an enormous amount of room in the rear for the bride & groom when the seats are stored away. The limousine's rear doors are very large giving easy access to the hugely spacious interior offering extra leg and head room. Our car is a "Landaulette" with a drop down rear roof section to give an open top above the rear seats. Ideal on a hot sunny day and perfect for wedding photos. The car can be driven with the top down without being windy for the passengers. The car is masons black over Olde English white with sumptious leather seating and matches perfectly with our fleet of white & ivory cars. Available as a main bridal car or as a second car for bridesmaids & family. The classic wedding car !! Style, space, oppulence and a Royal heritage included. 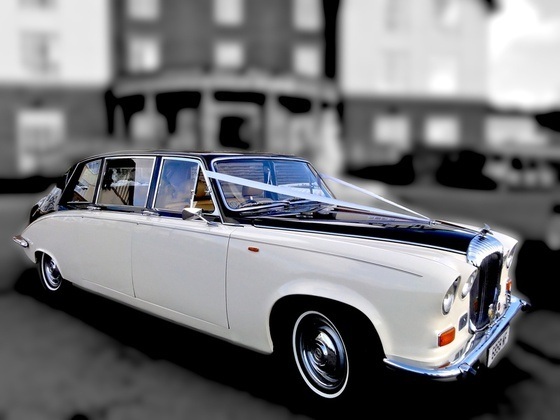 Limousines of Cheshire is a wedding car company based in Byley, near Middlewich, Cheshire. We are dedicated to providing a first class wedding car service on your wedding day, from the first contact right through to the wedding day itself. With our stunning range of Beauford wedding cars, luxury Rolls Royce and Daimler saloons, Baby Bentley, Mercedes and Stretched Wedding Limousines, we are confident that we will have something to suit all tastes and budgets. We can tailor our wedding car package to suit your budget, requirements and any special requests.